When a hot air fryer enters your life, there’s a good chance that there’s going to be a lot more veg to be peeled in your kitchen than there has been in a long while. The reason is simple: so many veg are far more interesting when air roasted or air fried, and it’s easy to do. The question arises as to what needs peeling and what doesn’t, and that is a matter of preference. Veg such as potatoes and carrots are equally good peeled or unpeeled when air roasted. (If you were caught peeling carrots in wartime Britain, you’d be likely to get your fingers slapped for “wasting food.”) Most people peel older parsnips; younger ones you can get away with leaving unpeeled. For truly crispy chips / fries and roast potatoes, though, you need to peel; don’t get me wrong, unpeeled versions are great, too, especially when there’s not a lot of prep time, but when you want the crisp roast potatoes that almost shatter when you cut into them, you need the skins off. 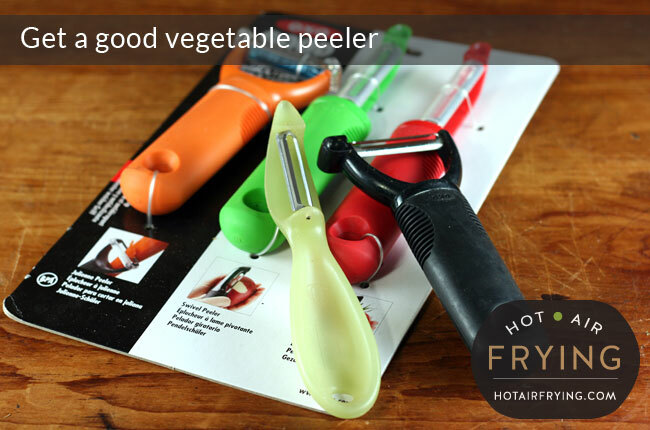 Peelers are designed to just remove a light amount of peel from veg, preserving most of the veg. A good vegetable peeler should be a joy to use — efficient, fast, intuitive and comfortable in your hands. If you dislike your current vegetable peeler, donate it to a charity shop. There’s probably nothing wrong with the peeler except that it’s just in the wrong person’s kitchen drawer. It will be right for someone, it’s just not right for you. Go hunt out a vegetable peeler that feels good in your hands. If that one ends up a dud, too, then donate it and hunt out another one. They are so inexpensive now, and life’s too short to be stuck with a peeler you hate. Note: For broccoli stalks, use a paring knife (serrated ideally) instead of a peeler. The peel on broccoli stalks is really thick and as tough as army boots even after 10 hours of pressure cooking, so you want to cut deep with a knife and get that off. 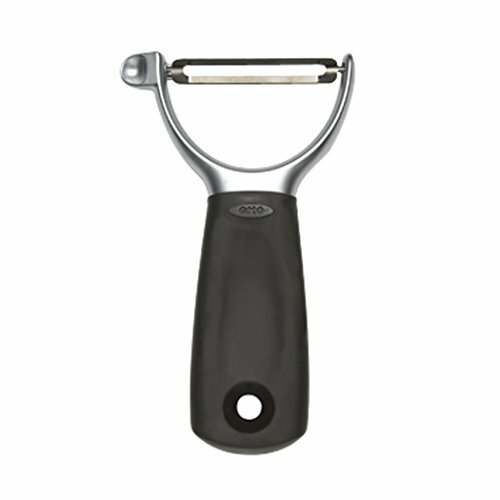 I myself like pretty much anything in the lineup of OXO good grips vegetable peelers. This one is my favourite in the drawer; your mind will hurt from the boredom of peeling long before your hand hurts from it.